Warning: Currently there seems to be some issues with alignment of the axis. Homing makes the bed move to 0 and then trying to proceed further. The motor makes strange noises because it can't move the bed further and then it continues normally. After the discovery, printing was not tested in order to not risk damaging motors. 4.4.2 You have your object and cleaned up after yourself, now what ? 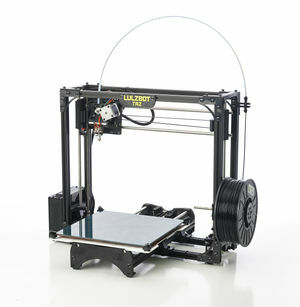 The Lulzbot TAZ printer is a commercial 3D printer put together and sold by the people at Lulzbot. It is designed using a metal-based frame with custom 3d-printed parts for corner-couplings and extruder-sections as well as controller-casing. LulzBot seems quite invested in using Open Source design principles and tools to produce their products. The [LulzBOT download-site] has files pertaining to all the sourcecode of firmware, software as well as CAD/STL/GCode files for producing the parts of the printer. More so, the [LulzBot Development Site] hosts files pertaining to future models currently in development. We had one donated to us by Lulzbot on the 28th of October through Aeva, a Lulzbot representative who was looking for a good home for one that was used as a demonstration-unit at (at least) the BlenderConference the weekend before. Techninc ended up being the lucky recipient of the unit and Aeva and Chris came by to help set up and test the unit, as well as provide assistance and technical guidance on using the machine. The machine is based on a regular XYZ-oriented setup; much like the Prusa i3. A pair of motors actuate the Z-height spindles, guiding the X-arm up along a set of guiding-rails. The Y-movement is realized by moving the heated printing-bed across a set of guiding-rails. The X-arm has an extruder-unit referred to as the 'Budaschnozzle 2.0' with a 0.35mm nozzle fitted. The bed and extruder are, as delivered, suitable for ABS-printing only ABS and PLA. The bed is coated with a special plastic; the extruder lacks now has a cooling fan for proper printing with PLA. For printing with PLA, one would need to fit a fan-unit on the side of the extruder-head (please find the two suppled screw-holes there) that would blow air across the cool-ribs and the printed object but would *NOT* blow across the metal of the nozzle. Also, the bed-surface should be adjusted , as well as heater-temp and extruder-temperature settings. As of 2013-11-17, the Lulzbot has been modified to be able to use PLA as stock-material as well. It has been fitted with a fan-duct mounted on the side by two M3 hex-key bolts. The supplied 40x40mm fan seems a bit low-powered and should perhaps be replaced with a stronger version in the future. Wiring has been made to run through the proper cable conduit and has been made so that the fan can be easily replaced by means of a male/female connector on the top of the extruder-carriage. When you've finished using Slic3r and have prepared a G-code file for use with the printer; please make sure that the G-code was for the right model printer, as well as the right type of filament loaded in the printer. Currently, the actual printing process is performed and monitored by PronterFace. Please find it in the '3d printing tools' tab at the top of the desktop. A future arrangement might instead use OctoPrint. Procedures for either should be greatly the same. Make sure that the printer is on and connected (both PSU-brick and control-unit). Also to USB. When pressing 'connect', the Lulzbot will report it's identity if the right port is selected in the side-bar on the right. If you can move the head around with the interface provided on the left, you are connected to the right printer. Set the 'bed' and 'extruder' temperatures according to the material you are going to print with and use the 'SET' buttons on the right of the selections to turn the heaters on. This will pre-warm the printer for use. Remove any left-over material from a last print-job. Dispose of plastic-scrap properly. Put 'ABS' and 'PLA' into the proper containers provided. Use ABS-glue or another adherent to re-coat the bed homogeneously. Quickly but evenly coat the uncoated parts of the bed with this mixture. Put the lid back on the jar! Dispose of swab properly (do not leave on ANY surface) or store properly for next use. Next up is checking if the extruder functions properly enough and/or if the filament is fed correctly through the gearing for it. Use the Z-height control in the printing-interface to move the extruder head upwards; 2 or 3 cm will do. When the temperature is high enough, use the 'Extrude' button to extrude an amount of plastic. The Lulzbot is protected against trying to extrude when the temperature is not high enough (a so called 'cold extrusion'). The Prusa seems to NOT prevent you from trying this. This will damage the filament and perhaps (and much worse) the gear-system. Be careful with this! Remove extruded material with a set of long pliers or a scraping-tool and dispose of appropriately. If the bed's coated to your liking and the extruder works; you're ready for printing. One last step, homing the extruder. Press the little 'house' to home the extruder in all axis. In Pronterface, this is on the lower-left corner of the 'circle' interface. You can home individual axis by using the 'X-home', 'Y-home' or 'Z-home' icons. When homing, it can be helpful to take note of the Z-movement downwards. The head will likely touch the bed at first, then retract and then approach the bed more slowly. Ultimately it should NOT push the bed down. If it does so, it can be because of some extruded material left behind, which is no real problem. It can, however, be required to re-calibrate the Z-height end-stop. For more information about this, please refer to the 'Troubleshooting' info here. You are ready for printing when you connected to the printer, prepared the bed, checked the extruder , homed your extruder (!) and were able to load the G-code file of choice into your printer-interfacing software. Simply pressing 'Print' will probably not result in immediate printing motion. It is likely that the printing-software will check the bed/extruder temperature, wait till it's just right and then, in the case of the Lulzbot, do a small countdown (visible in the bottom left of the interface in Pronterface). To allow the extruder to 'get going' and show you if the plastic's properly adhering to the bed. If the extrusion is still not looking nice and coherent at the end of printing the shroud, you might be in trouble. In case you also made Slic3r add a 'brim' to your print (advised when printing tall objects or if you have other adherance problems), you still have some time for the extruder to get up to speed while it's printing this brim. If at the end of the brim it's still not adhering correctly, it's unlikely to get any better soon. Issue: small droplets extruded; not adhering to the bed. Cause: Bed and/or extruder temperature too low for material. Possibly bad bed-coating. Check and verify that the G-code you loaded was made with Slic3r using the right presets for the material AND device you are printing with. Of importance are temperature for bed/extruder as well as extruder-thickness. Lift extruder up using the Z-height controls in the interface, verify proper extrusion by pressing 'extrude' and checking length and speed of extrusion. If failing, undo clip of filament gearing, retract filament carefully and check hobbed-bolt teeth for excessive debris that might cause it to slip. Verify thickness of filament is thin enough to fit through hole below the gear-train. Some 3MM filament is , in fact more than 3.2mm in some places; getting stuck in the print-head due to excessive friction. Use calipers to check. Hurray; the first layer's printed nicely and is adhering to the bed ? Great, then you are ready to witness the miracle of your object becoming taller and taller. At the second layer, the printer should be turning on it's cooling-fan; especially important in the case of printing PLA! Somewhere at or after the third layer, you should be starting to see infill-patterns being used in areas of sufficient thickness. If all goes well the layers will adhere nicely to eachother and you will be able to enjoy the object soon....but..
Bad layer adherence: lines 'roll' off eachother due to dripping. Prevent the extruder passing over the same area too often in a row by placing some 'dummy' object elsewhere in your object-file so that the last line gets time to cool down. It's possible that when printing, you get regular deformations each time the extruder hits a turn/corner. These might be caused by a number of things. Backlash is the 'play' or 'room' on the drive-trains (belts/pullies/rods) that make that a back/forth motion isnt instantaneous. Backlash is something the machine's design should combat as much as possible. Oscillation is where the machine's forced to move an actuator at a rate that coincides with a natural resonance-frequency of the machine's frame. Nothing much can be done about this except to make the machine as stiff as possible to prevent oscillation from occurring. There are also settings in Slic3r that allow you to limit certain occurances of movements from happening. Overshoot is where a machine's actuator 'overshoots' a desired end-point due to insufficient deceleration. Possibly due to over-confident settings in Slic3r for the machine. The design of the machine can limit overshoot problems by making all moving parts as light as possible. Especially the extruder-unit is important in this. These symptoms are lumped together as they're all interrelated but can have slightly different causes and ways to fix them. You might find that the layers get deposited nicely but then start warping or even curling upwards after multiple extra layers have been deposited ontop of it again. Sometimes even resulting in the base-layer peeling away from the bed and resulting in a failed print. It is likely that the cooling-function of the fan-duct isn't properly working OR that the settings in Slic3r have failed to turn it on. Especially with PLA it is important to cool the newly printed layer actively, as well as cool down the rest of the part sufficiently. PLA has quite a long melting-stage, running over tens of degrees centigrade. In essence, the optimum extrusion temperature and the 'solid stage' temperature are quite a bit apart. This means that if you leave the newly printed lines to cool by themselves, they might not end up being cool enough for another layer to be printed ontop of it. Even worse, the printed part of the object will retain heat of it's own. Heat from the new layers seeps through the lines already printed and vice-versa. If care is not taken to cool with force, the plastic might end up overheating and thus curl, warp or even scorch. Printing on warped layers that end up being in the wrong place is a sure way to get a failed print. This symptom is, as noted, more likely to happen with PLA than for example ABS which has a tighter solid->fluid range. Don't forget that overhangs are a tricky thing to print in the best of cases, impossible in the worst of them. The general rule of thumb is to make sure that there are no overhangs of more than 45-degrees in any part of your design. Layer-adherence (see above) is essential for them to come out nicely at all. Parts with bridges or steep overhangs can possibly still be printed if you properly configure Slic3r to use 'support' structures. This will make it include thin and spindly structures in your print that are designed to support overhanging topology in your objects and are easy to break away and remove after printing. First thing to check is to see if the part is still properly adhered to the bed. It is possible for the part to come loose when subjected to layering new layers ontop of the object. Especially when the 'footprint' of the object is very small in relation to it's height, there will be considerable force available for it to be 'toppled' and broken free of the bed. To fix/remedy this, one should first make sure that the bed was properly coated and heated for the plastic to be able to adhere to. If this was all in order, the next option is to include a 'brim' (of say 3mm) in the Slic3r settings. This will print a brim of (in this case, 3mm) around the footprint of the object, extending it's adhesion and making it harder to break free. After printing, it's advised to peel the brim upwards a little before considering to pop the part free from the bed. Second thing to check is to see if the layers below suffer from any of the warping/deforming/scorching issues as noted above. One cannot layer on bad layers. The default 'end of print' G-code should include a command that turns off the bed- and extruder-heaters. This is to protect the extruder , mainly (see notes about PLA damaging the extruder if left on extrusion-temperature too long). Turning off the bed-heat , however, will result in the part popping free from it after a while. The expansion/contraction motion on the interface between the plastic object and the glass bed will often be enough to simply 'break' the part off with a simple toppling motion. If you do NOT want to wait and are in a rush to print a next piece and thus don't want to cool the extruder and/or bed down entirely OR have trouble removing the part even with a cooled down bed, please try the following. peel away the 'brim' with a scalpel/spatula if it was included in your print. use a spatula or the 'oyster-knife' to get underneath a corner or edge of your object. be careful of not damaging the bed when doing so. The Lulzbot comes with a layer of plastic film on the glass that rips easily. If this fails, one can also try using a light hammer to tap close to the base of the object; possibly together with the use of the spatula/knife. Be careful to not damage the bed-covering too much. Be wary of using too much force and whacking the bed-alignment out of calibration. First, make sure you turn off the heaters of the bed and extruder!!!. Whatever else you aim on doing with the printer , unless you are doing it *soon* , please don't leave these two on unguardedly. It might cause accidents and is definately not good for the extruder in the case of PLA filament. Thirdly, please take a moment to re-apply a layer of adherant (ABS-glue) to the bed for the next user to be able to print right away. Especially important for the situation where remote-print-management is introduced. You have your object and cleaned up after yourself, now what ? The printed object is likely a bit rough around the edges and could use some post-work. Sand away irregularities, polish surface with sandpaper. Works better with ABS than PLA. Use acetone on ABS parts to smoothen them. Doesnt work on PLA. Once you're happy, put object to good use, display proudly, brag about it, etc. The machine should normally be left correctly calibrated and usable after a previous print-run, but there are reasons why certain things might end up having to be adjusted again. The bed-level might be skewed after having had to remove a particularly 'sticky' object from the bed with excessive force, for example. Or the printer might've been moved around , skewing the frame just enough for it to require re-calibration in it's new position. Other reasons might include inadvertant bumping or loosening of end-stop-points or bed-level clips. Two things that are particularly essential for proper printing are covered here, Z-height calibration and Bed-levelling. Proceed to Z-height end-stop adjustment when: the whole print is either too smeared or adhering badly across the whole printing area. Proceed to Bed-level adjustment when: the print only smears/beads closer to a particular corner or edge. The machine has a mechanism to detect when the extruder is about to hit the glass of the bed. It does this by means of a switch located on the lefthand inner-side of the front upright aluminium profile. This switch is triggered by a small screw sticking down from the left-most Z-screw carriage. It has a little red 'cap' to locate and adjust it more easily. Like with bed-levelling below, it is useful to use a calibration target such as the one provided [here] by Lulzbot. If the print , as a whole , is too thin/smeared: adjust the screw CLOCKWISE , extending it and triggering the switch earlier. If the print , as a whole, is not adhering, beading, stringing: adjust the screw ANTI-CLOCKWISE , retracting it and triggering the switch later. The best way to gauge the correct Z height is to start by trying to insert a piece of paper between the extruder and bed. The paper should drag ever so slightly. After that further adjustment should be done via the software, with test prints so you can check with your eyes what the best Z value is. Please use the 'z-home' button in the printer interface to check the result of your adjustments. Be wary of adjusting too much; extruders pushing into the bed are not a good thing. Tuning is quite fine; a quater-turn is likely more than enough to go from 'good' to 'disastrous' or vice-versa. The glass plate of the printing bed has to be aligned perfectly with the X/Y motion of the extruder-head. It's important to have the extruder 'float' at the same height above each and every part of the printing-bed. If this is not the case, layer-height will vary and, likely, influence layer-adherance, causing either smeared/smudged lines that are too thin (not too problematic) or beading or 'floating' lines that simply do not stick to the bed sufficiently (very problematic). To correct the bed-levelling, it is useful to use a 'bed level target' file such as the one at [Lulzbot] which prints a large skirt closely along the maximum circumference of the bed, after which it will print two overlapping elipses and some straight lines inside of this space. Observe while printing how the lines 'stick' to the bed. If they are too flat, the bed needs to be lowered at the corner/edge. If the lines are 'floating' or beading continuously (despite proper extrusion), then the bed-height needs to be raised in that area. Adjust bed-height by using a small hex-key to adjust the spring-loaded bolt on each of the edge-clips. Leave the other one alone. It should be obvious that if a whole edge is affected, you need to adjust the two adjacent corners.